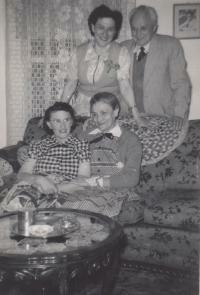 Arnott and Vederoff Ancestors - On couch, Esther Sakker Vederoff (right) with an unknown woman. Standing in back ar Esther's sister Ronia and her husband Chernov. Photo taken at the home of Esther in San Francisco, California sometime between 1952 and 1955. On couch, Esther Sakker Vederoff (right) with an unknown woman. Standing in back ar Esther's sister Ronia and her husband Chernov. Photo taken at the home of Esther in San Francisco, California sometime between 1952 and 1955.